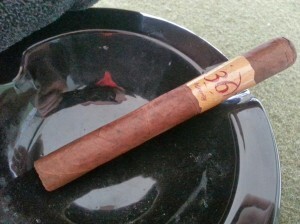 Back at the 2012 Chattanooga Tweetup, one of the sticks I received in my pack of cigars was a small, nondescript cigar simply marked “36” – or so I thought. I didn’t smoked that cigar until I returned home from the trip. When I did, I enjoyed it so much I made a couple of phone calls and internet queries trying to find out some more information about it. 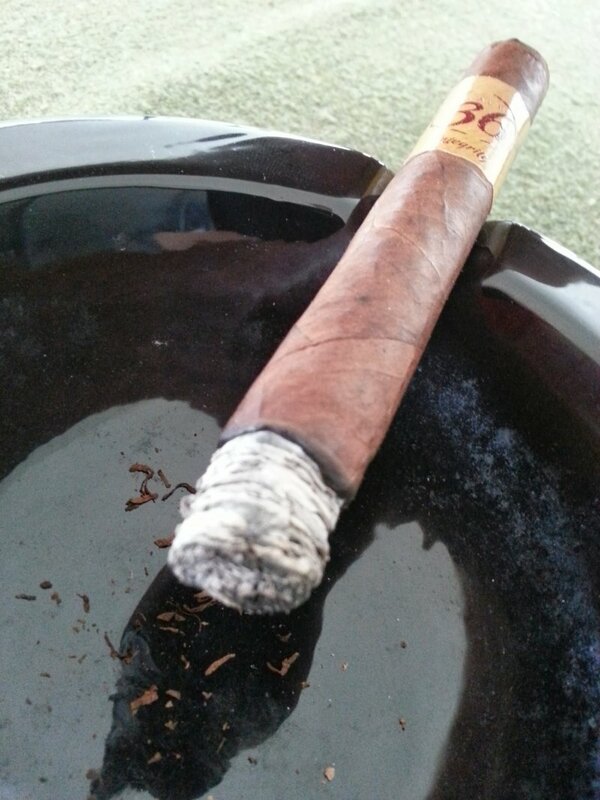 Turns out, it was from a Missouri based company called Table 36, and the cigar was called Fellowship. I did a little more digging and came to find out that there were no retailers in my area that carried the line, and the company prefers not to have their cigars sold online. Disappointed, I went back to my normal routine of smoking what’s readily available. Fast-forward to IPCPR 2013. I happened upon Table 36 at the show, and dropped by their booth to chat up the representatives and learn more about the cigars. After spending some time talking with the folks at the booth, I learned they have a very interesting back story on how the company came to be, and that they had released a new line called Integrity. I was given a corona gorda from the Integrity line to smoke, which is the subject of today’s review. The Integrity is a Nicaraguan puro, featuring a Jalapa wrapper, double binders (Esteli & Jalapa), and filler blend of Condega and Jalapa tobacco. It is produced by Nestor Plasencia, and is available in 4 vitolas (Corona Gorda (5.5″X46), Robusto (5″X50), Toro (6″X50), and V58 (6.5″X58). MSRP on the line ranges from $7.15-8.65. For today’s review, I smoked the sample given and another example I received through trade with an acquaintance. Giving the Integrity a quick once-over, it has a medium brown coloration, with some light mottling and a smooth, oily feel to the wrapper. The veins are clearly visible but moderate in size, and I find neither dense nor soft spots in the bunch. From all appearances, it is exceedingly well made. The prelight draw has a straightforward tobacco flavor and a moderate resistance – just about perfect for my tastes. Worth mention is a slight tingle on the tongue after a cold draw – which I will learn is a precursor of things to come. Upon first light, the initial puffs of the Integrity are quite bold and spicy. This being a Nicaraguan puro, I expected more spice in comparison to its older brother Fellowship (which is medium in strength and largely comprised of Honduran tobacco). However, the Integrity (to my tastes) is more than one notch above the Fellowship in terms of that familiar pepper. If pressed to assign some flavor descriptors, I’d definitely go with red pepper this early in the cigar, which is most perceived on the retrohale. There is a sort of nutty backdrop to that spice as well, which really presents on the finish. All this being said, the flavor that will likely strike a chord with readers is that of tobacco. Very good, very Nicaraguan……tobacco. About an inch or so into my time with the Integrity, the pepper has ever-so-slightly abated, although I’m not sure if this is the cigar or if my palate has adapted. Going into the midsection of the Integrity, the “nutty backdrop” mentioned earlier continues to develop and begins to show more of a woodsy bent – a bright, cedar flavor to be precise. I have to say that smoke production on this cigar has been voluminous….not that it means anything to most folks, but I thought it worthy of note. The ash has been had a consistently mottled, rumpled texture to it. While it doesn’t cling tightly enough to set any length records, I never felt in danger of ashing myself and setting my pants ablaze. By the end of this portion of the cigar, the rusty old synapses in my mind and flavor perceptors of my palate assign a more leathery character to the flavor. The spice remains at the ready with retrohale. The final stretch of the Integrity comes in with an upswing in prominence of that leathery flavor, yet still displaying the sweet, dry nuttiness of the Jalapa in the blend. The spice that has been interwoven throughout also picks back up remarkably in the final few minutes. I had no beverage with the Integrity either of the times I smoked it, but I imagine this would go phenomenally well with a strong cup of coffee. 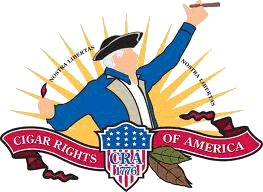 While approachable for most anyone, the Integrity will be most appreciated by those who enjoy bold Nicaraguan tobacco that makes its presence known (as I do). The interplay between this spice and the nutty flavors will definitely keep even the most finicky smokers interested. I hope Table 36 has continued growth….at least enough to get a retailer in the Tampa market, as I would love to have these at hand on a regular basis. Selfishly speaking, Tampa needs this cigar (if the guys from Table 36 are reading, this is a hint). Highly recommended. Man that cigar sounds as though it’s straight down my alley. Guess I have a project today!